Your humble brad nailer is more than a mere woodworking tool. It is the brush of an artist, the muse of inventors and entrepreneurs, and the solution to an infinite number of DIY fix-it problems. 6. Long Live Mr. Fix-It! 8. Oh Brad! You’re The Perfect Placeholder! What is a brad nailer used for? It shoots brads—small, thin nails—into wood. Brads are made from .18-gauge wire, which is thinner than common .15- and .16-gauge finishing nails. Brads range in length from 5/8-inch up to 1-1/2 inches, and leave a smaller hole than finishing nails. This means almost no wood putty—and sometime no putty at all! From the ornate millwork on Grandma’s old fireplace mantel, to replacing/repairing/replicating the fancy trim around the windows and doors in your 100-year-old home, brad nailers can securely and discreetly rejuvenate antique furniture. Even a novice antique furniture lover will find countless uses for a brad nailer, from fixing loose trim, to making ancient mortise joints whole again. Woodworkers use brad nails and special adhesives to make chairs, storage cabinets, and furniture, but it doesn’t take a pro to make quality furnishings, especially if you know how to use a brad nailer. Brad nailers are either electric or pneumatic. Pneumatic tools require an air compressor to power the tool. Electric brad nailers are less expensive and good for small projects, but a pneumatic brad nailer will give you more power and durability. Cordless brad nailers use a mix of rechargeable batteries and compressed air canisters, but they don’t come cheap! You can make countless crafts for your home, office, or classroom with brad nails—the only limit is your imagination! You can build a picture frame from a few small pieces of wood. A specialized nosepiece on some brad nailers can be adjusted so that brad heads are left exposed. Shoot yourself a funky mandala, grab some colorful string, and unleash your inner string artist! Also, consider a .23-gauge pin nailer for fine craftwork. You can easily add a posh and polished look to your home if you know what a brad nailer is used for. Turn your lackadaisical living room into a pleasure palace with the addition of baseboards or crown molding. Brad nailers are invaluable if you own an older home. A brad nailer is great for simple fixes, like securing door and window casings, but it’s also ideal for recreating, replacing, or repairing antique millwork. By layering various strips of common wood trim, you can mimic the ornate millwork of yesteryear, and give your older home a finished and authentic look. You’ll be amazed at how these finishing touches can increase the resale value of your home! Pack up your paintbrush and put away those messy rolls of wallpaper! Paneling is making a comeback. Gone is the tacky, faux wood paneling that invaded the finished basements of American homes in the 1970s. (Actually, you can still get that groovy, retro look if you want it.) Today’s wood paneling is a vast improvement over the cheap plywood of yesteryear. We live in a disposable world where things aren’t built to last—they’re built to fall apart. This is especially true if you buy items from the dollar bin at a big box retail store. There’s cute stuff, but it’s poorly constructed. Instead of tossing that trash out, save its life with a brad nailer! A couple of brad nails can turn a flimsy piece of junk into a treasured family heirloom! Angled brad nailers can fit easily into tight spaces. Some experienced woodworkers claim angled brad nailers make all finishing work easier, from securing long runs wood, to fitting into the back corners of cabinets. Brad nailers are smaller than finishing nailers, allowing you to worm your way into some incredibly tight spots! Brads can’t bear heavy weight for long, but they’re perfect for temporarily holding a board or piece a trim in place until you can drive in a heftier finishing nail. This is especially helpful if you’re working in awkward locations. Finishing nails need to be placed away from the ends and edges of trim, molding, or baseboards, but brads are an exception. You can usually drive a brad within ½-inch of the end and 1/8-inch of edges of wood without splitting. A brad gun is essential if you’re working with delicate pieces of wood. Avoid blowouts by watching the angle of the nail. Align the nail gun and fire straight. Break off bad brads. If nails protrude more than ¼-inch, grab the shank and bend it until it snaps off, or use side-cutting pliers to shear the nail. Break or cut off side blowouts. Use your nail set to recess the remainder. Avoid under-driven nails. Fine-tune the nosepiece and air compressor settings of your brad gun so that your brad heads are slightly recessed. Safety first! Make sure you abide by these safety precautions and usage tips. What is a brad nailer used for? What isn’t it used for! Long live the brad nailer! For more info on brad nailers and thousands of other woodworking tips, visit Let’s Wood. To become a trusted resource where people can come and learn to create everything from wood. To provide the best, most reliable, easy to understand, creative woodworking tips. To create and nurture a community of supportive woodworkers willing to help each other be a better woodworker. Surf on over to LetsWood.com and learn the finer points of how to use a brad nailer as well as a variety of other woodworking tips. Discover the zen oneness and enduring strength of tiny steel nails. 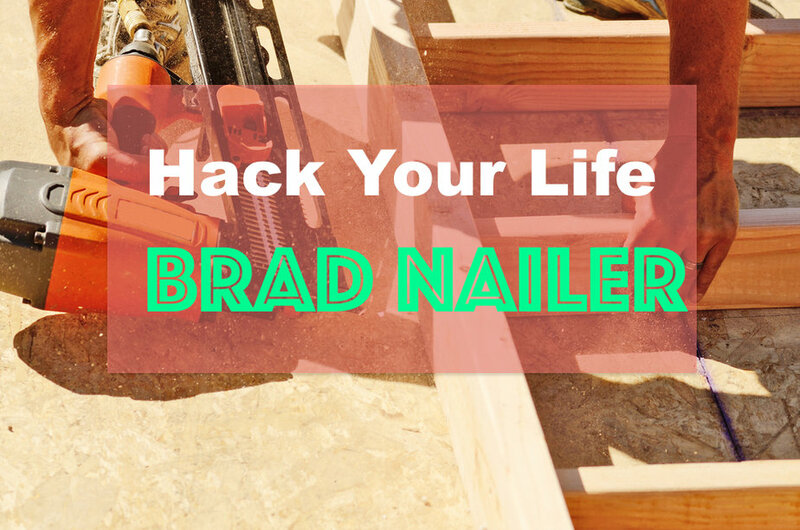 Become one with your brad gun, and the next time someone asks, “What is a brad nailer used for?” share the enlightenment!